Members of 15th (Vancouver) Coast Brigade RCA CA in 1942. Harrison, TL; Captain,, Adjutant in 1942. 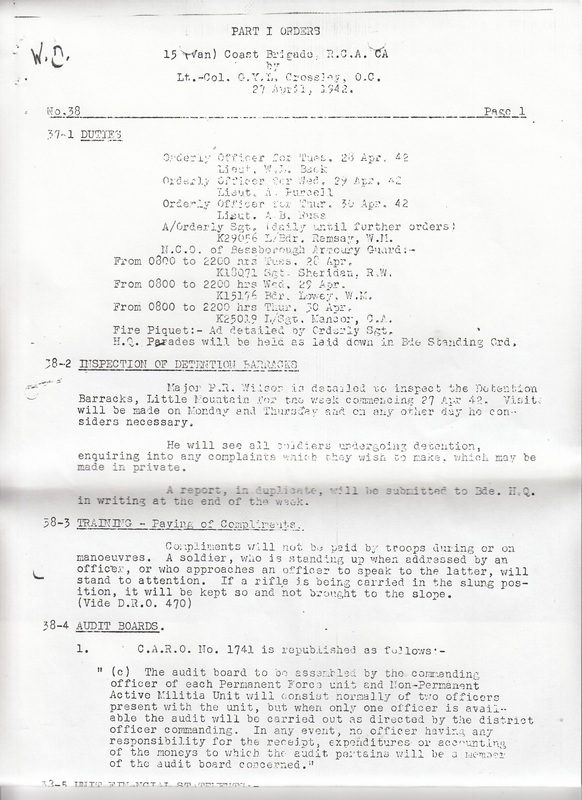 15th (Vancouver) Coast Brigade, RCA was renamed 15th (Vancouver) Coast Regiment, RCA on 1 June 1942. 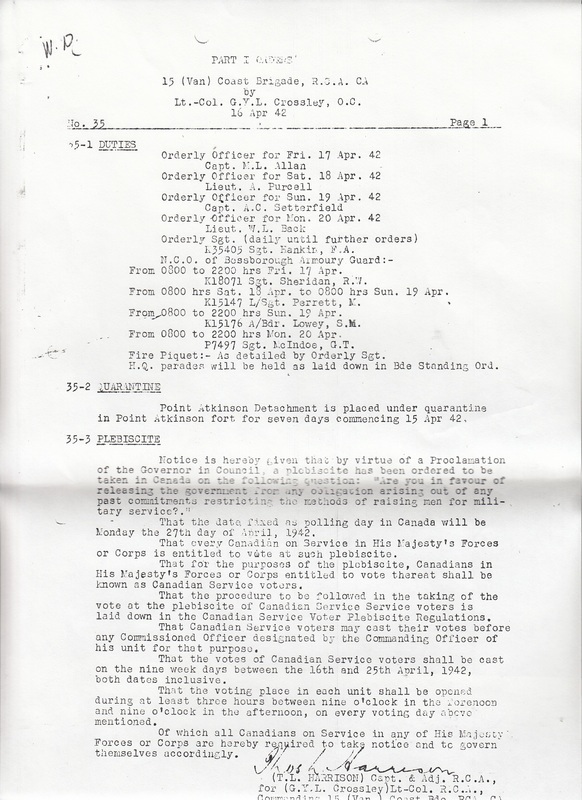 The full extent of the Vancouver coastal defences and their role in the protection of Canada's west coast were outlined in the local Fire Commander's Orders of October 1942.7n keeping with security regulations, the earlier standing orders issued by the commanding officer, who was customarily the Fire Commander, had been destroyed and the 1942 orders are the oldest ones in existence. 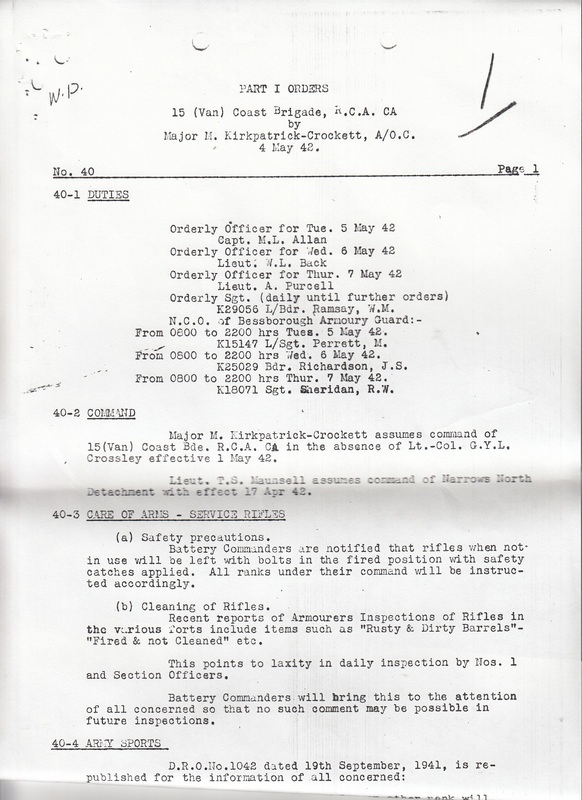 The standing orders reveal that though the defences were elaborate they were also deficient in many things. 1 . 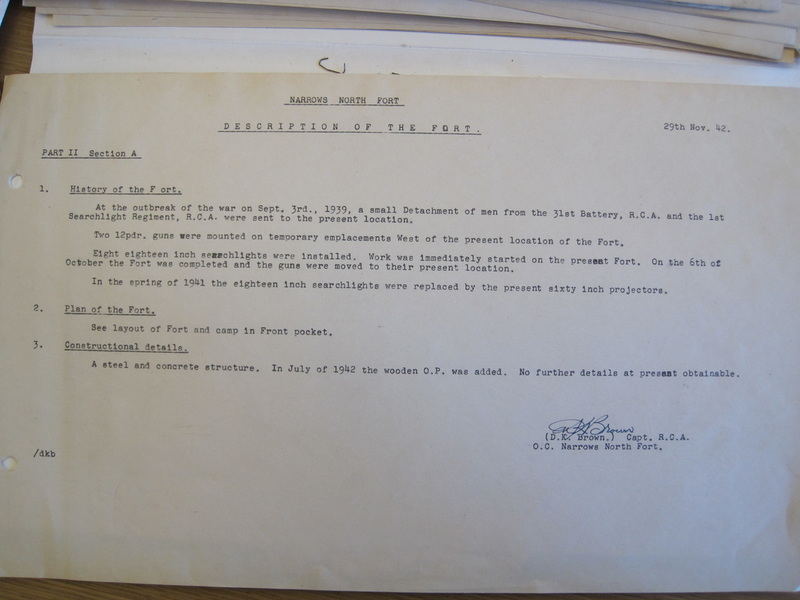 Role of the Fortress in the Scheme of Defence. 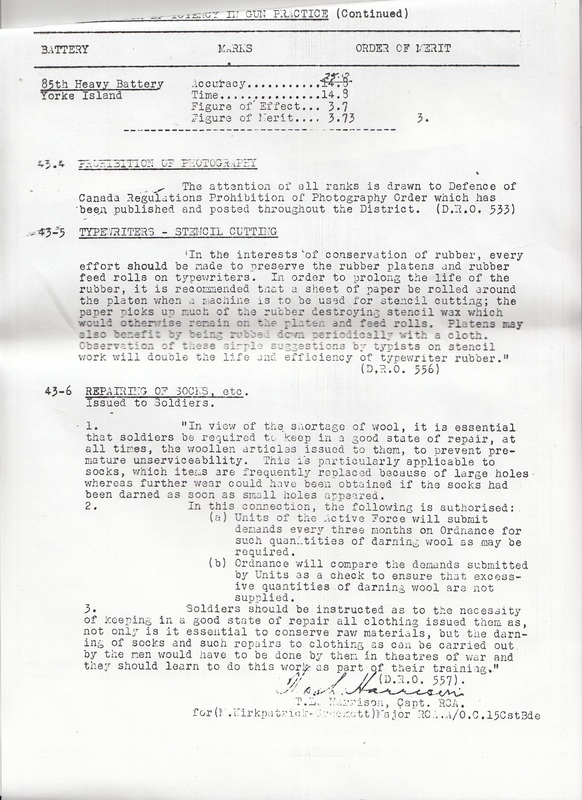 The extreme outer defences of British Columbia are supplied by the R.C.N. 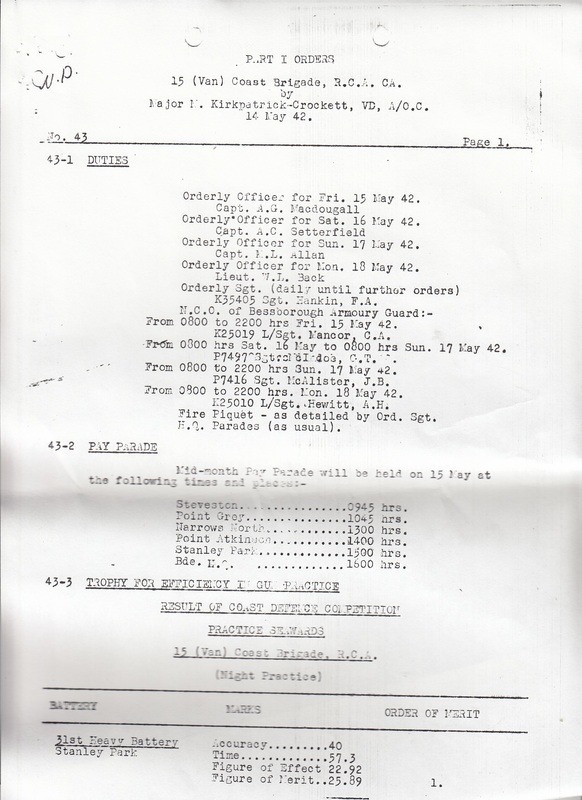 patrol vessels and R.C.A.F, seaplane patrols. Owing to the prevalence of fog in the summer and South-Easterly gales with rain and snow in the winter off the West Coast, it is possible for an enemy to elude observation, in which case he would meet the forts in the Straits of Juan de Fuca, Yorke Island or Prince Rupert. For the defence of Vancouver, the Forts on both sides of the Straits of Juan de Fuca and the Fort at Yorke Island act as barriers to an attack on Vancouver. There is considerable amount of fog in the Straits of Juan de Fuca and Naval Authorities advise it is quite impossible for a determined enemy to slip past Victoria in fog or at night, to attack Vancouver. 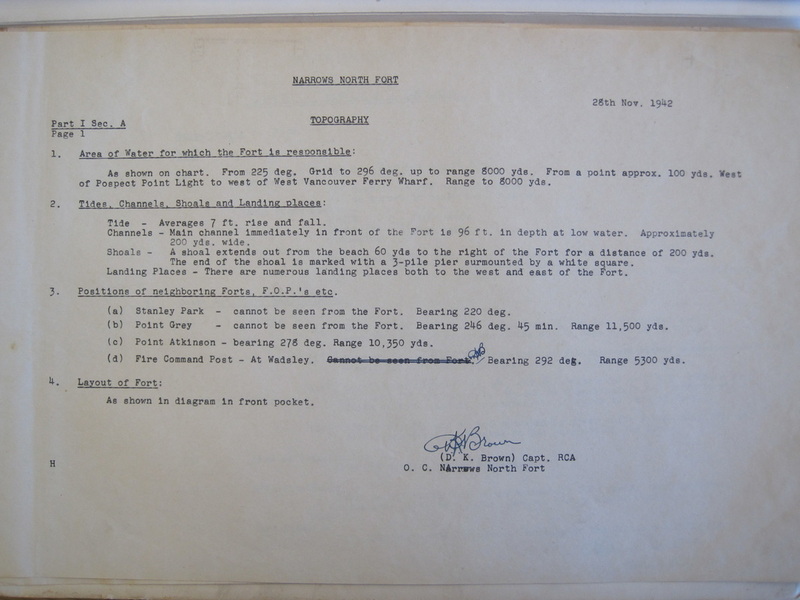 The Fort at Yorke Island guarding Johnstone Straits is equipped with two 6" Mk VII guns with a limited range of about 11,000 yards, consequently it is quite possible for an enemy to force his way past these defences on the way to Vancouver or Bremerton, by water. 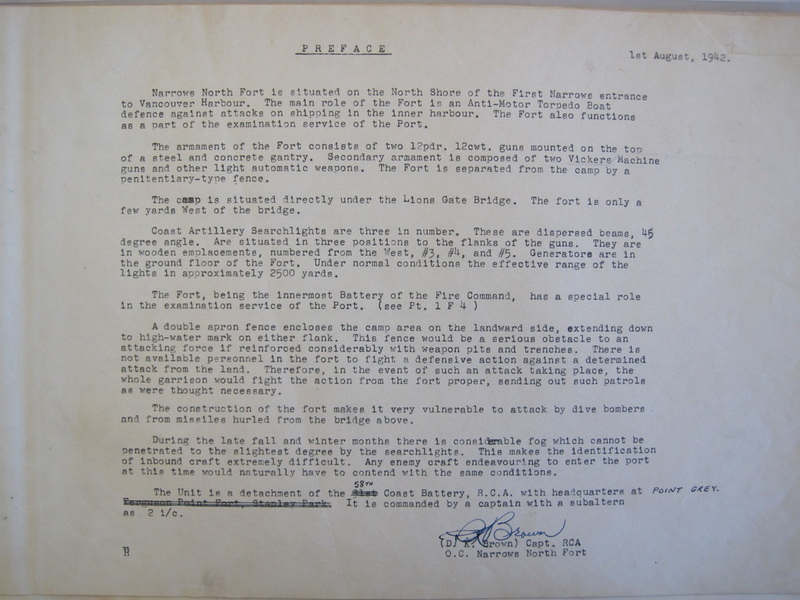 The role of the Forts in Vancouver is to repel any hostile vessel in the waters adjacent and to assist in repelling any troops attempting to land on shore. 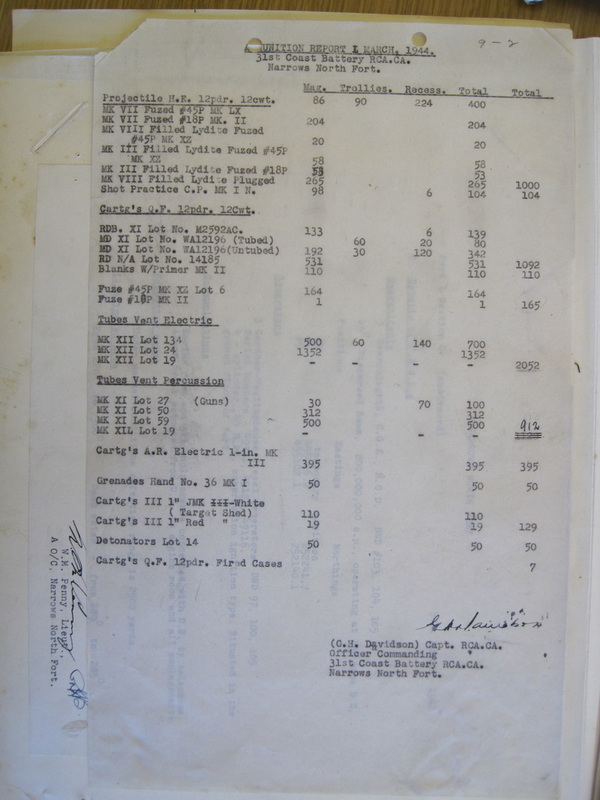 For this purpose, the Forts are allotted as follows: Point Grey: Designed for a counter-bombardment battery of three 6" B.L, (breechloading) guns on 45" mountings. Owing to the difficulties in obtaining 45o mountings from England, they are mounted on 75o mountings, consequently are only adapted for close defence. Stanley Park: Close defence battery guarding English Bay and the First Narrows entrance to Burrard lnlet, equipped with two 4.7" B.L. guns on 20o mountings. 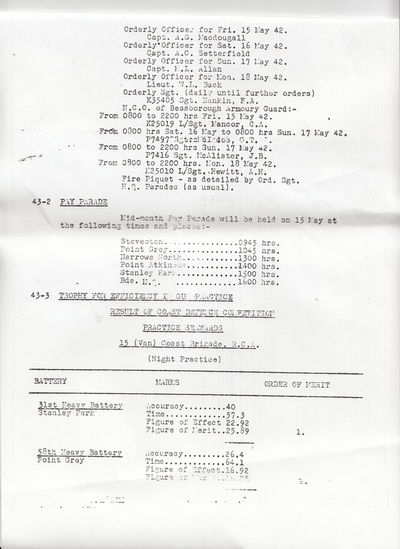 Narrows North: Two 12-pdr. guns. Close defence against Destroyers, M.T.B. 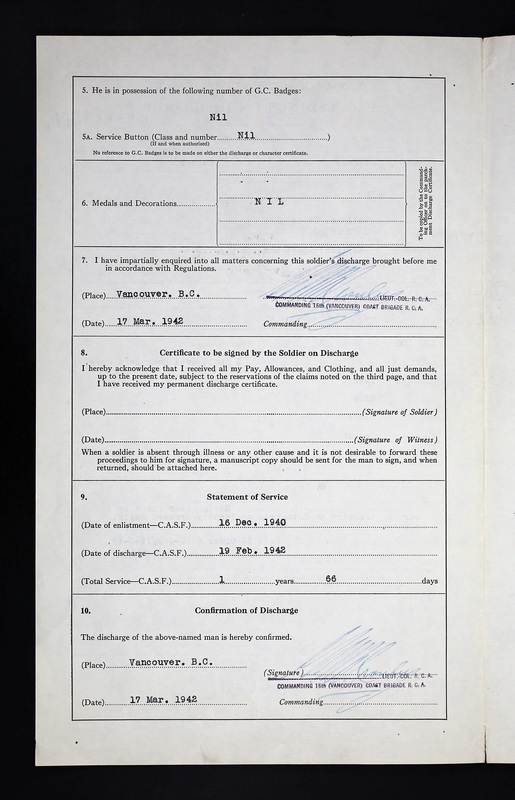 's (motor torpedo boats) or small craft. 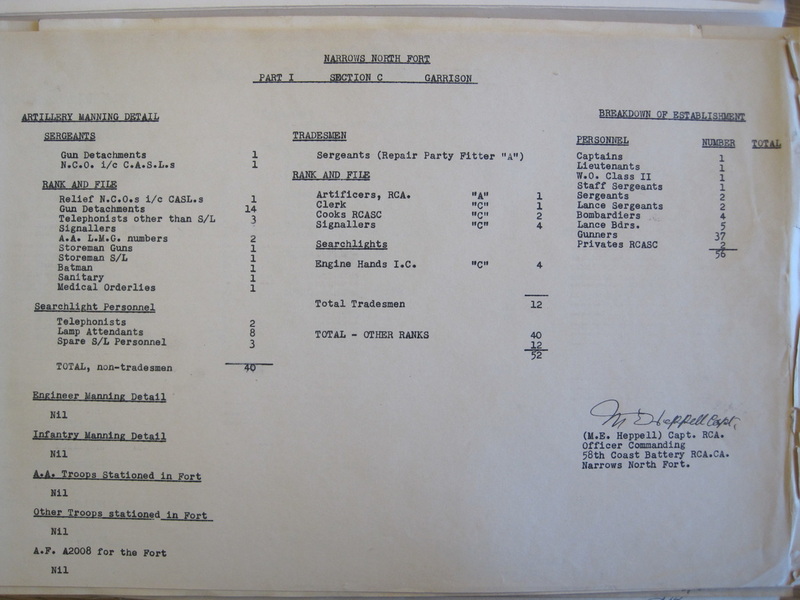 Steveston: Two 18-pdr, Q.F. 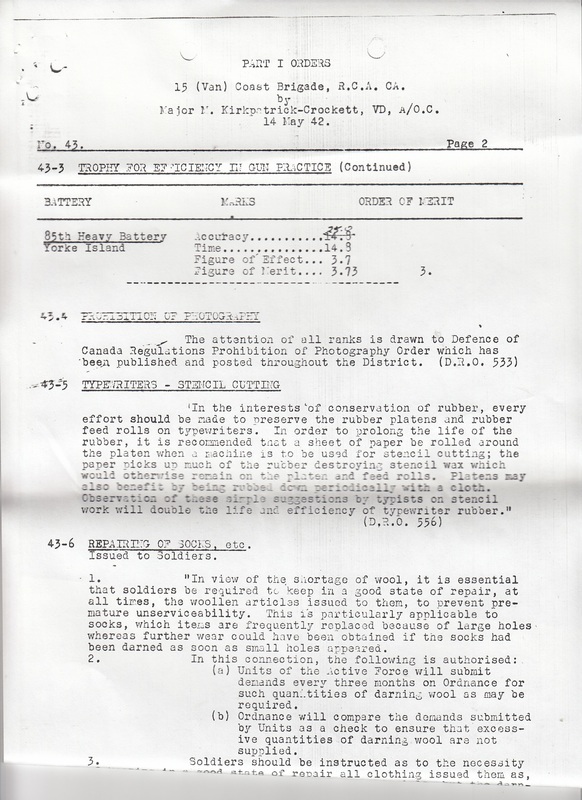 (quick-firing) Field guns to guard the south arm of the Fraser River and to prevent vessels proceeding up the South-Arm to New Westminster. Point Atkinson: One 18-pdr. Q.F. 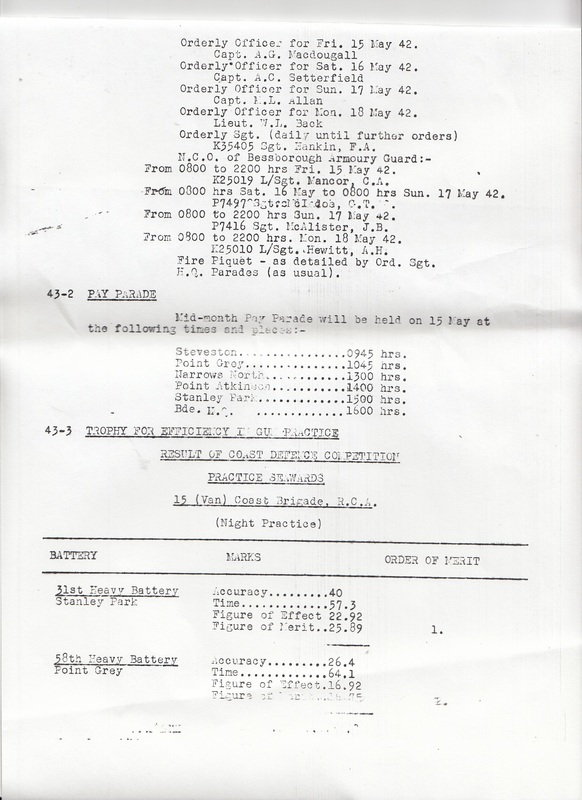 Field gun - very limited use in defence. 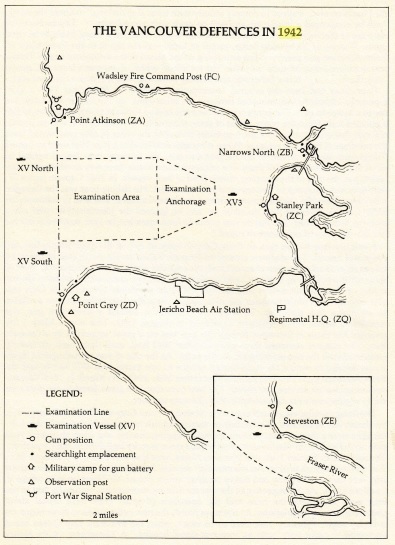 Examination Batteries (to challenge and detain incoming ships): Point Grey and Point Atkinson. 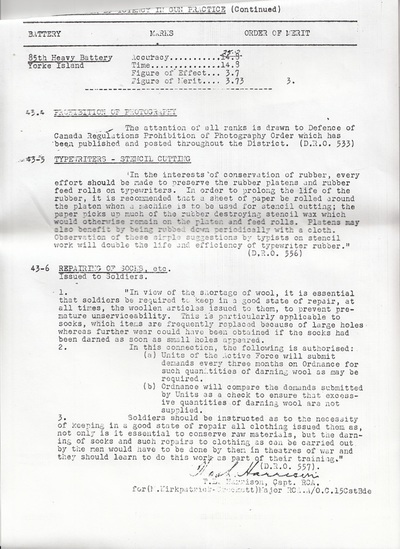 (e) Defence - The R.C.A.F. 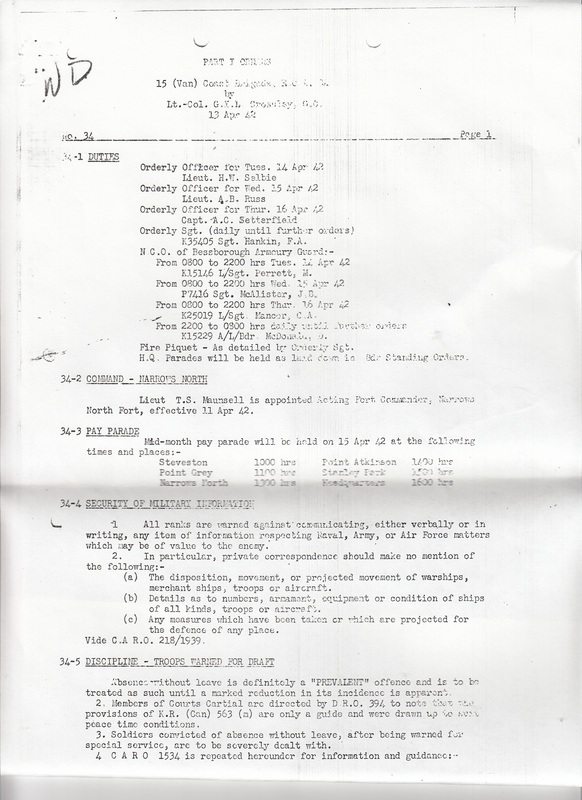 has fighter squadrons and is responsible to employ them to the best advantage in Air Raid defence - but - all Forts are responsible for their own Iocal defence. (a) Command Line - A line used for tactical purposes only is carried over B.C. Telephone Lines, which is bridged through their exchange for perpetual hook-up , with an Exchange at the F.C. (fire command) Post. Fire Command Post _____________________ F.C. Steveston Battery is not included on this line. (b) Submarine Cable - A 2-way submarine cable exists between Point Grey and Point Atkinson for the purpose of communication between the Examination Battery (Point Grey) and P.W.S.S. 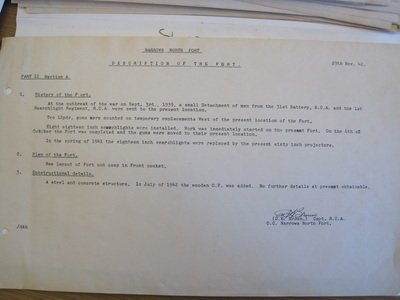 (port war signal station) (Point Atkinson). 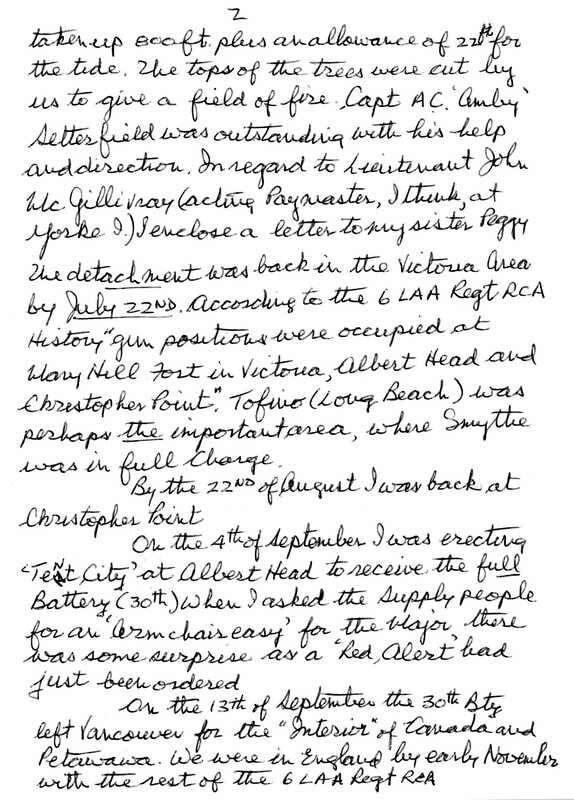 The forts could also communicate with one another and the examination vessels by radio and the entire Vancouver defence system was linked by the telephone system. In addition to the battery code names, there was a code for the alert states of the fire command. Beginning with "Sword" and working up through "scabbard" and "Spear" the code reached "Dagger" which meant assume battle stations. 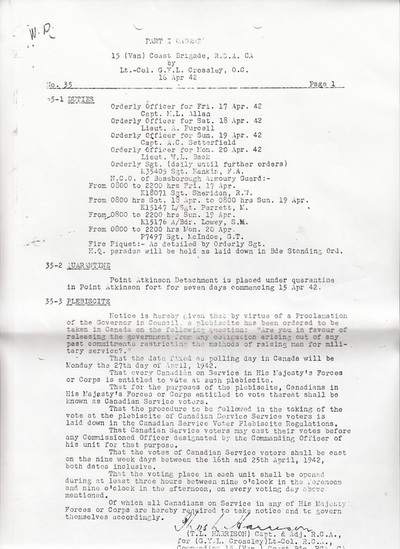 Taken literally, the Fire Commander's Orders of October 1942 could be misleading. 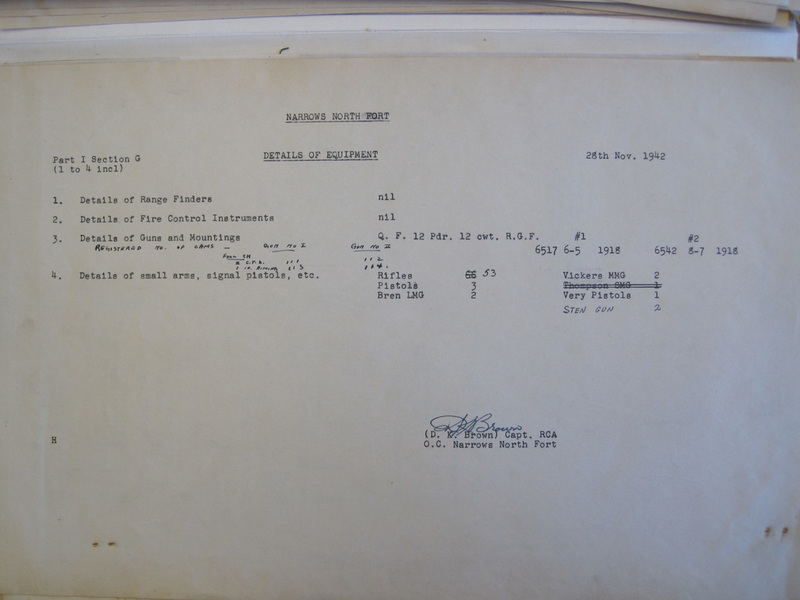 The "patrol vessels" of the Royal Canadian Navy then consisted of three mineweepers and a few auxiliary vessels supplemented by the boats of the Fishermen's Reserve. 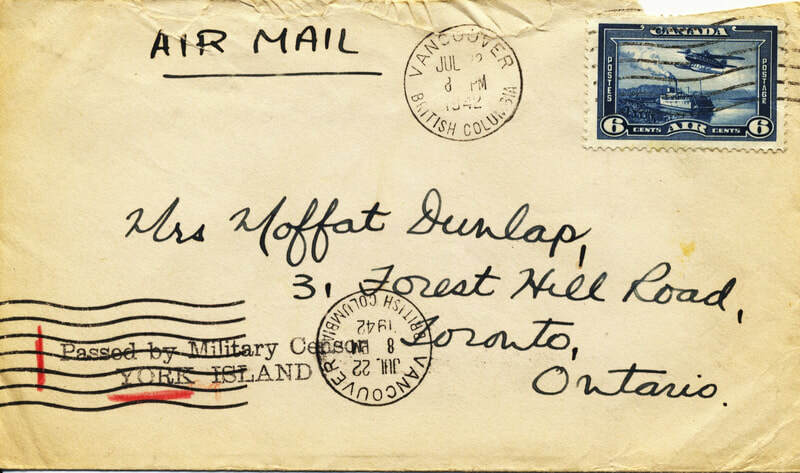 The four destroyers formerly stationed at Esquimalt had been transferred to the Atlantic coast. 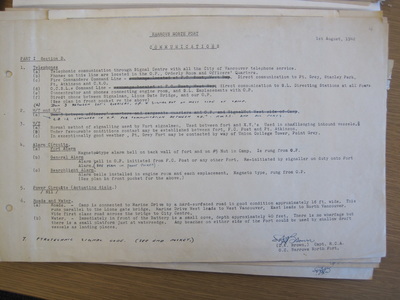 The Royal Canadian Air Force "seaplane patrols" originated largely from the Jericho Beach Air Station on English Bay. This pioneer air station had been established on a part of the old naval reserve in 1920 and during the Second World War it was a base for the double-winged Blackburn Sharks and Supermarine Stranraers. 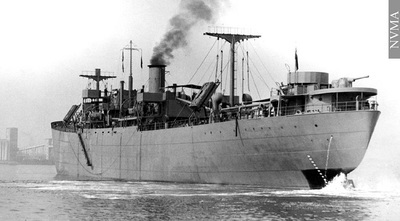 It was the two-engined Stranraer that patrolled the length of British Columbia's coastline and sent back radio reports on all ships sighted. 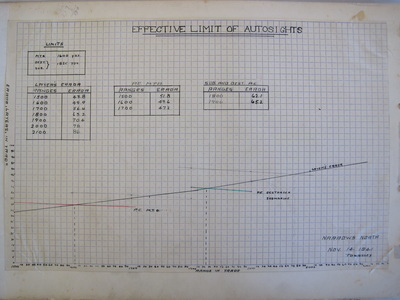 A brace of twenty-pound bombs hung below each wing. 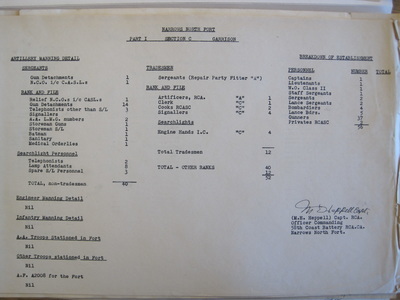 The Vancouver defences also had the support of a squadron of aircraft based at the Patricia Bay airfield. The Victoria-Esquimalt batteries covering the Juan de Fuca strait were indeed formidable and they were coordinated with guns on the American side. 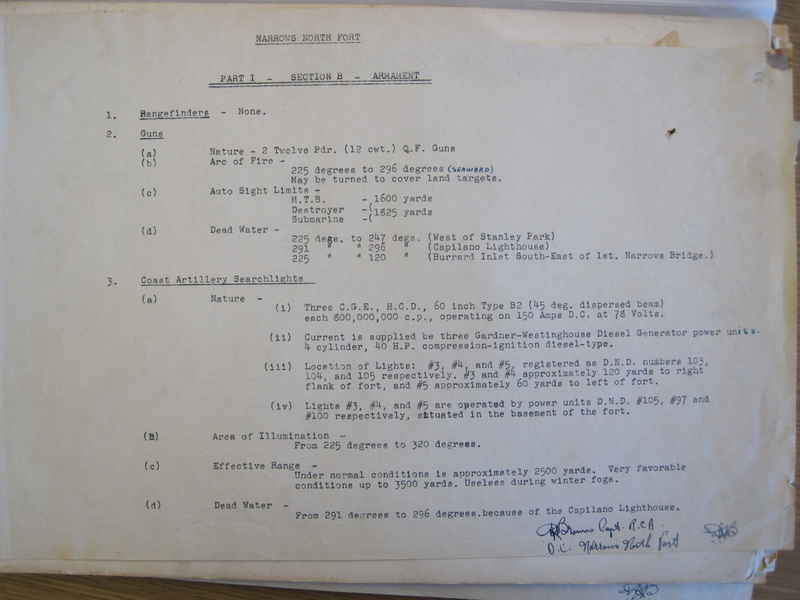 There was a 9.2-inch calibre battery at Albert Head, two 6-inch batteries and four positions armed with 12 pounders. 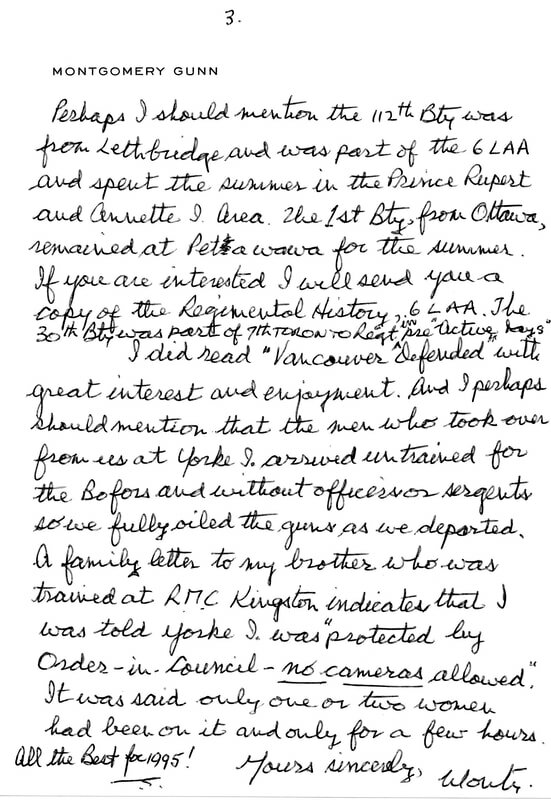 The guns were as old and their mountings as deficient as those at Vancouver. Yorke Island to the north had been bolstered by exchanging its original 4.7-inch guns for the 6-inch pieces at Stanley Park. The exchange was accomplished in the summer of 1942 in what was supposed to be secrecy. 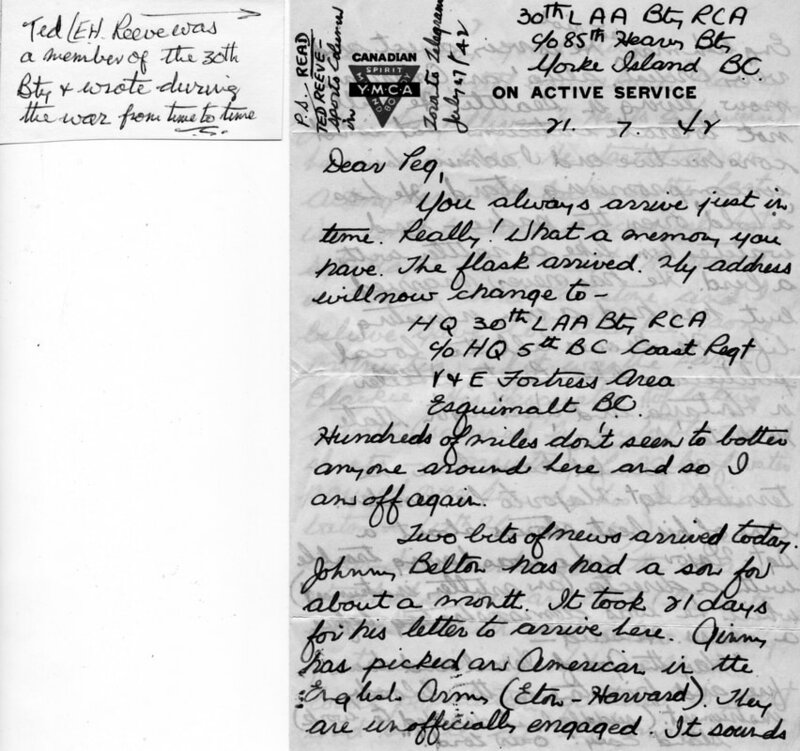 The security achieved may be judged from the fact that a gunner on Yorke Island received a letter from his wife in Vancouver reporting the arrival of the 4.7-inch guns. Could this be the Point Grey Fort at the beginning of the clip? Recognize any faces? The incident that … causes embarrassed laughter among veterans of the 15th Coast occurred on September 13th, 1942. This was when the gunners proved that they could sink a ship, albeit a friendly one. D. Ken Brown had taken over command of the Narrows North detachment in late June 1942 and he believed in a firm application of the port security regulations. With the approval of Col. Hood, the guns came into action. The firing of heave-to rounds provided useful training for the troops and it cowed the fishermen into conforming with the wartime rules. 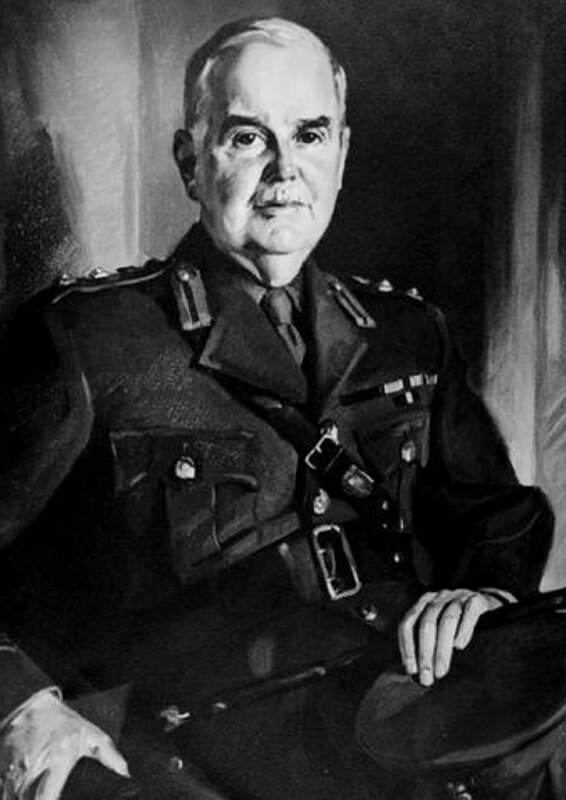 "Once heaving tasted the idea of using the rules to provide practice," recalls Ken Brown, "then, on the slightest opportunity, when it was permissible for us to fire, even though we suspected rather strongly that they were friendly, (...) we fired that round, as the rules called for it, two degrees ahead of the target so that the splash could be seen. It was more realistic than the normal gun drill." This gave young Lieut. Brown a reputation: "the nickname I acquired, 'Gunfire Brown,' was because during the first month that I was in command I remember firing something like thirty-one rounds." Ken Brown remembered that on that fateful Sunday afternoon, when "the famous or infamous misadventure" happened, it was overcast and windy. A fish-packer chugged in past Point Atkinson and ignored all the signals to identify himself . 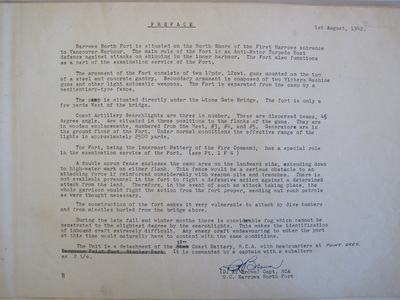 As the boat approached the narrows, the fort there received an order to fire a stopping round. 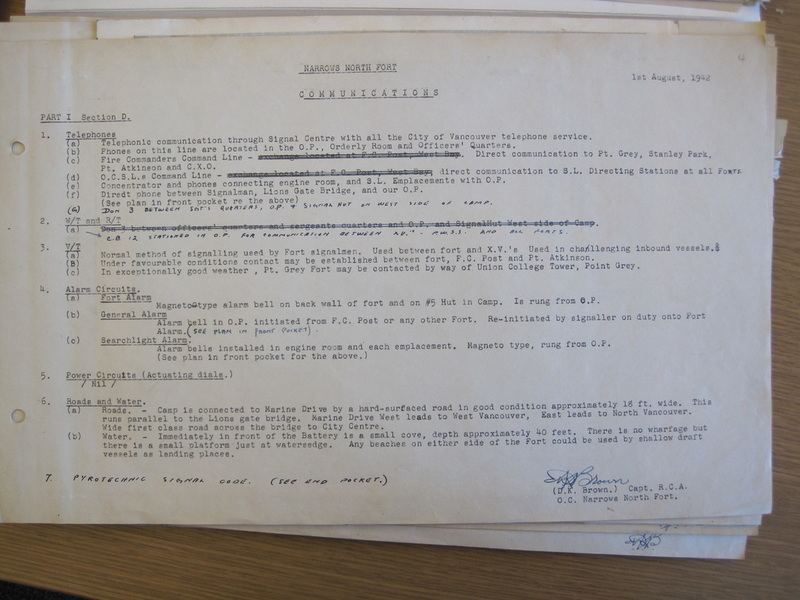 "The message came from the examination vessel stationed just off Point Atkinson." states Ken, "I think it was a radio message. The battery was at rest normally until an alarm was sounded and that was activated by messages received from the examination vessel. We were away from the gantry and had to run several yards gathering our helmets and equipment. 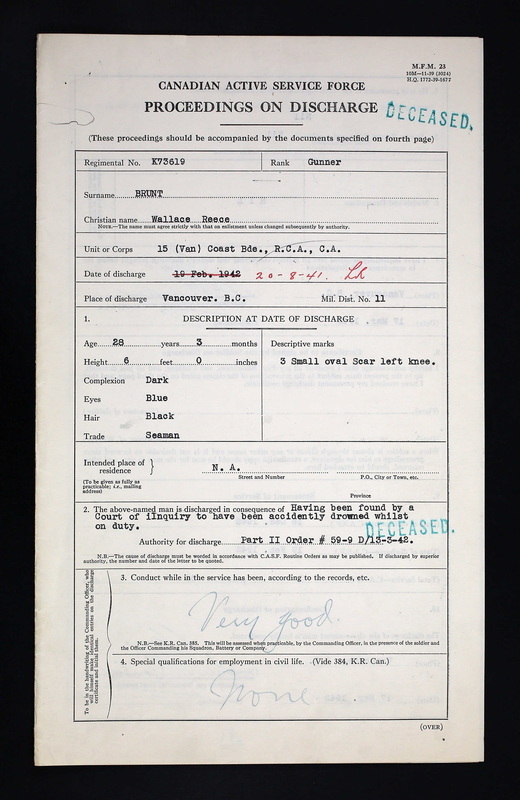 We arrived on the scene rather disturbed." 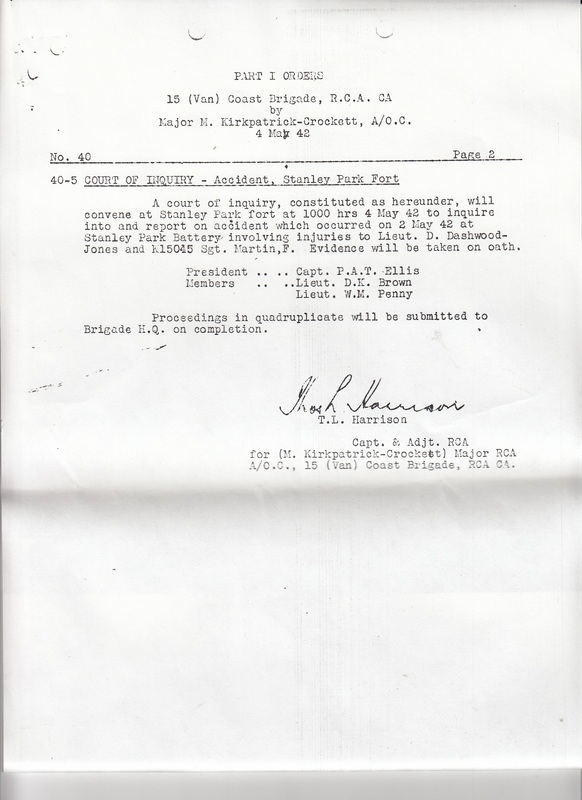 When the gun was fired "we had the desired result: the fish boat stopped." The plugged shell, however, had not stopped. Instead of kicking up a splash and sinking, the round hit a wave and ricocheted across the water at an oblique angle. In its path lay a freighter recently launched by Burrard Dry Docks and now undergoing speed trials over a measured mile in English Bay. This was the 9,600 ton Fort Rae. E.L. "Paddy" Copeland, who was on the beach at Ambleside with his wife, saw what was happening despite the haze on the water. 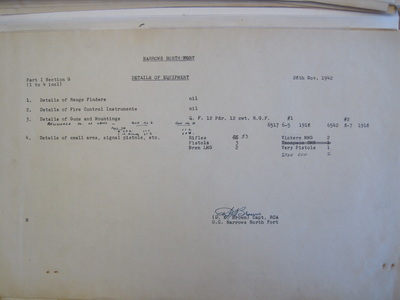 "When we saw this shot go skipping across the water, I said to my wife 'it's going to hit that freighter' (... ) they hit it amidships right at the waterline (...) it went right through it. That's the one and only time I saw that happen." The damage was greater than anyone imagined. The non-explosive shell had entered the No. 3 hold, just forward of the engine room, and left a neat hole above the waterline on the near side of the Fort Rae. Yet unseen by those present, the shell tumbled after impact and, striking sideways, it punched out a larger hole on the far side of the hull below the waterline. 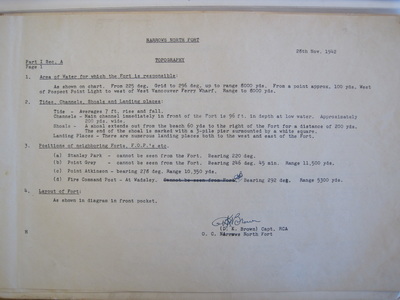 Ken Brown picks up the story: "there was no alarm until they finished that testing run and turned to come into the (inner) harbour, at which time the hold was flooding and there was obviously panic. They beached the hull just inside the Lions' Gate Bridge (...) I wasn't very popular with the ship's captain and Col. Hood wasn't very pleased with the incident." The beached ship was subsequently patched up and floated off the north shore tidal flats to be returned to the builder's yard. 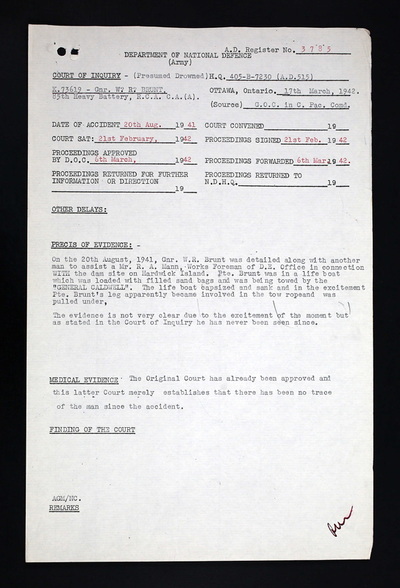 An army court of inquiry was set up [o investigate the episode and the charges of Captain Semple and his crew that the gunners had deliberately fired three shells at their ship, including a shot through the rigging. 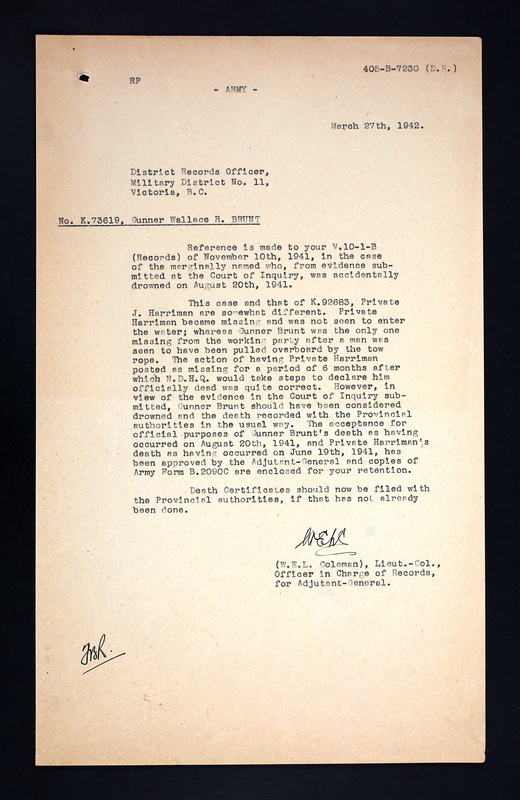 "Fortunately for me," remarks Ken Brown, "we were able to prove that we had only fired one round legally and within the rules." A.F. 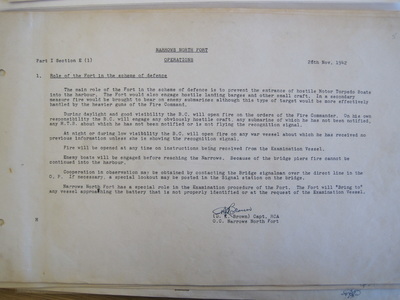 Menzies, retired chief engineer of the Burrard DryDocks, remembers a distressed gunner from the fort saying "For God's sake, don't talk about it; there's been enough misery." 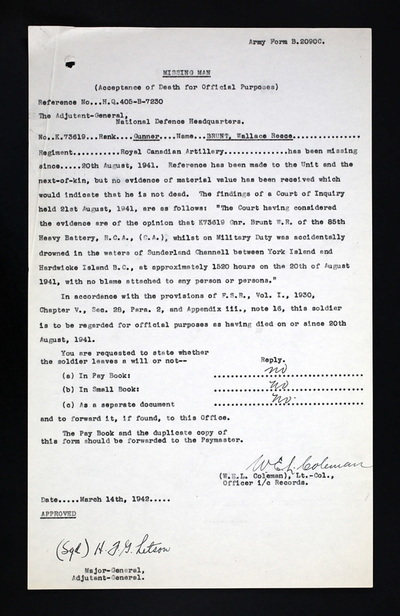 The archivist of the shipyard, J.R. Holden, describes the accident as "quite a joke - it was supposed to be a military secret." Yorke Island now took on a much more important role and it was decided that her armament should be increased. 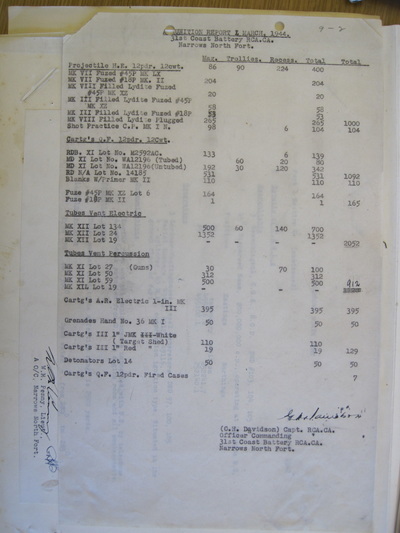 With no surplus guns in Canada and those on order in England unlikely to arrive for at least another year a straight trade was made with the two 6-inch guns at Ferguson Point in Stanley Park, Vancouver and the two 4.7-inch ones at Yorke Island. To keep both batteries operational only one gun from each was to be moved at a time. The changeover was to take place at the end of June 7942 and early July. 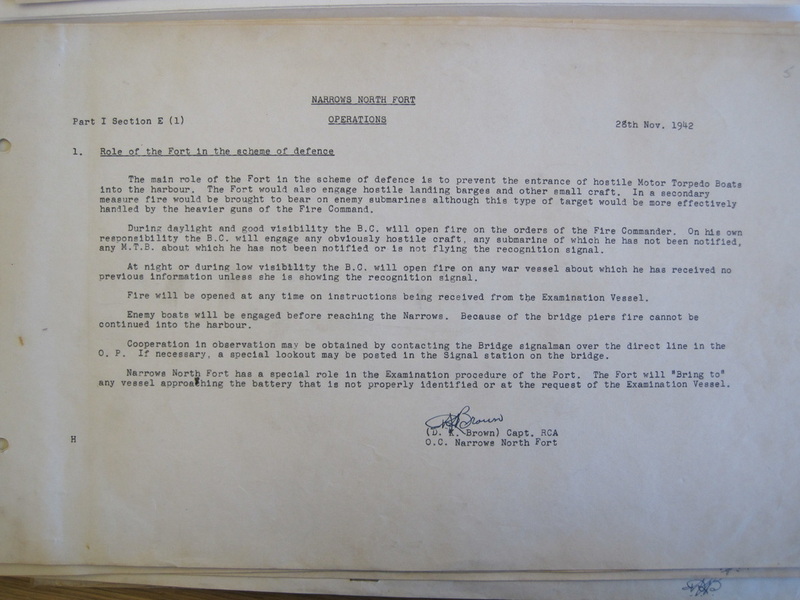 Tension was mounting at this time as the Japanese were now in the position of being able to launch a hit and run raid. 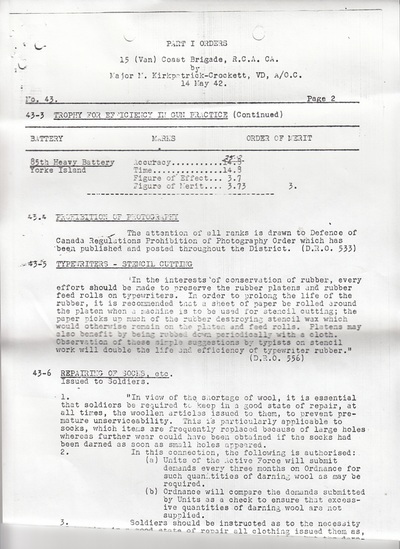 Dutch Harbour, Alaska was bombed on June 3rd,1942, and on the evening of June 20th the Japanese submarine I26 fired approximately seventeen projectiles at the Estevan Point Lighthouse on the West Coast of Vancouver Island. This was to be the only direct attack on Canada in over one hundred years. 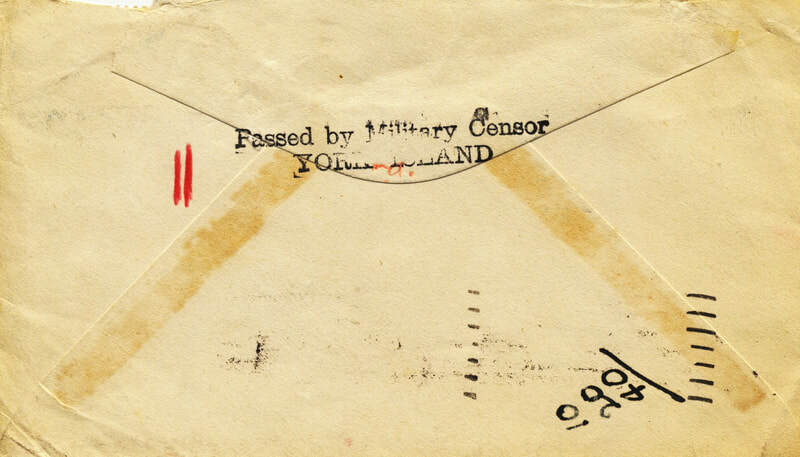 A code message of 1,072 letters received at battery headquarters on June 24th required one and a half hours to decode. 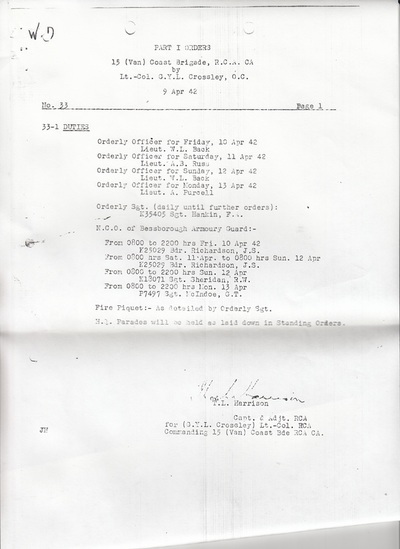 Much to the dismay of the cipher clerk it contained the details of the attack on Estevan Lighthouse which had been broadcast for all to hear over every private radio on the island the day before. 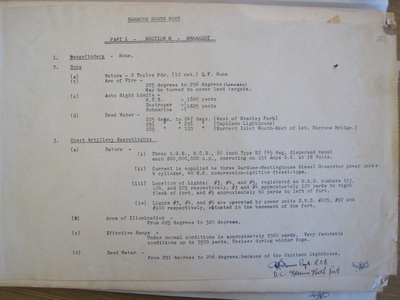 In the midst of the confusion of dismantling the first 4.7-inch gun 25 anii-aircraft gunners arrived from the 6th Light Anti-Aircraft Regiment's 30th Battery commanded by Major Connie Smyth of hockey fame. 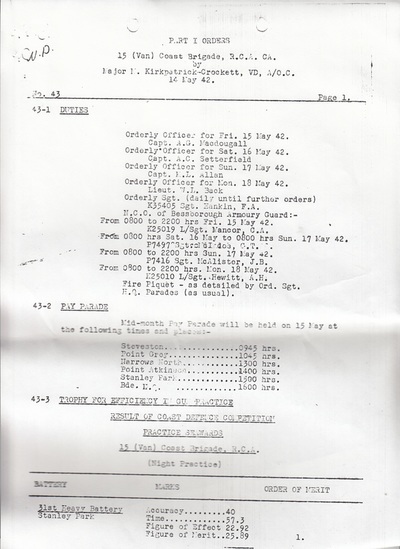 They were to provide the first real air defence with two Bofors 40 mm guns. The next day (lune 26th) at 4:00 p.m. the first 6-inch gun arrived by scow and after waiting for the rising tide it was unloaded by midnight. After much hard work by all available men the 6-inch was mounted and ready for action at 9:00 p.m. on June 28th. 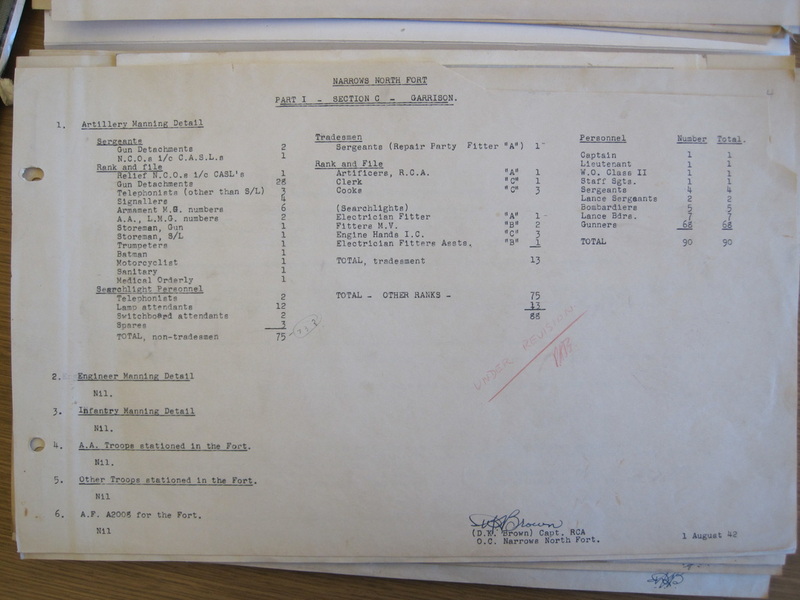 The second 6-inch arrived July 1st and both guns were in action and test fired on July 3rd. The fort now had a gun capable of firing approximately seven 100 pound rounds per minute, a distance of eight miles. 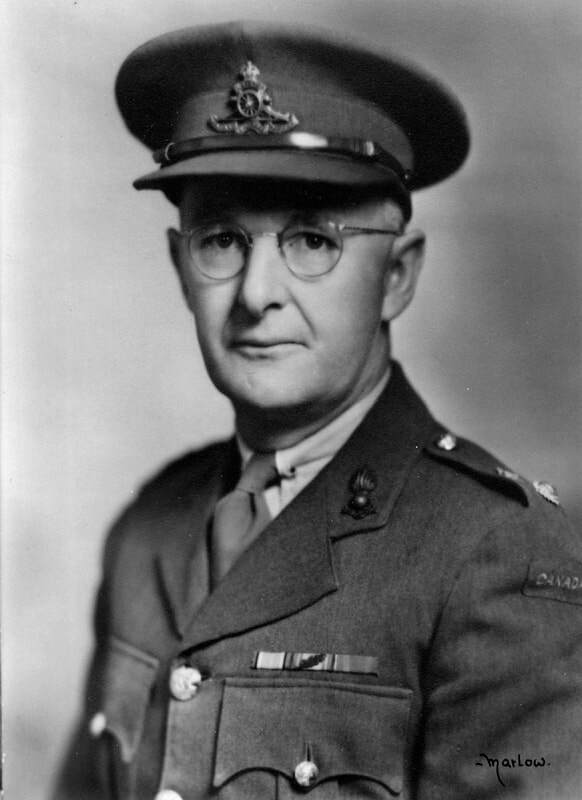 The 30th Light Anti-Aircraft Battery was also known as the "Sportsmen Battery" with the Battery Commander Major Conn Smythe of Toronto Maple Leaf fame. 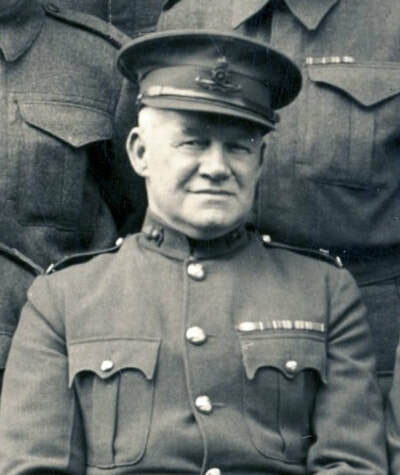 Major Smythe had personally recruited many of the members of the Battery and there were a considerable quantity of National Hockey League players. Some ex-members of 15th (Vancouver) Coast Brigade RCA transferred to the Canadian Overseas Expeditionary Force and took part in the Dieppe Raid with their new units. Many of them are remembered on our Dieppe page. 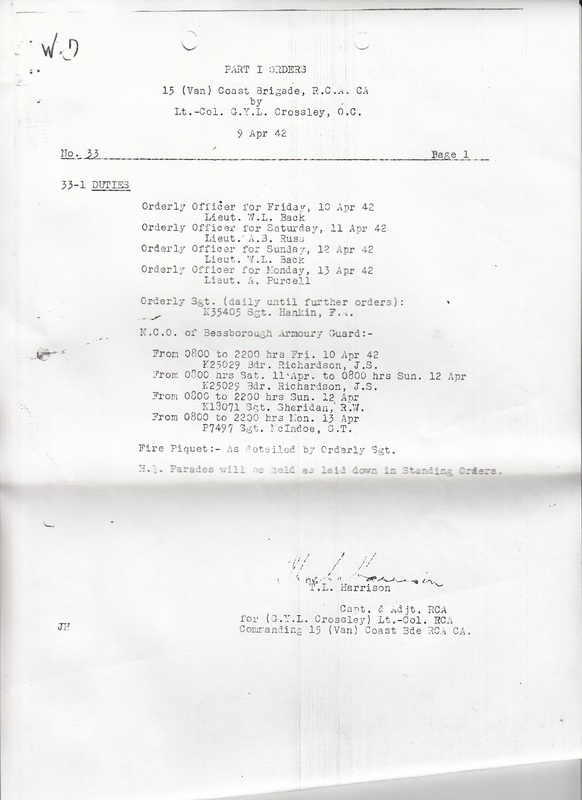 Following files illustrate the movement of paperwork after Gunner Wallace Brunt’s death on 20 August 1941 which was required to complete the distribution of Service Estate. 6 March 1942 – Court of Inquiry Findings approval for the court which sat on 21 February 1942. 14 March 1942 – Army Form B.2090C. 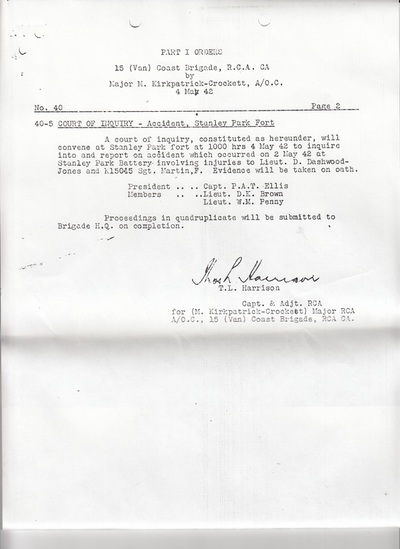 Missing Man, Acceptance of Death for Official Reasons. 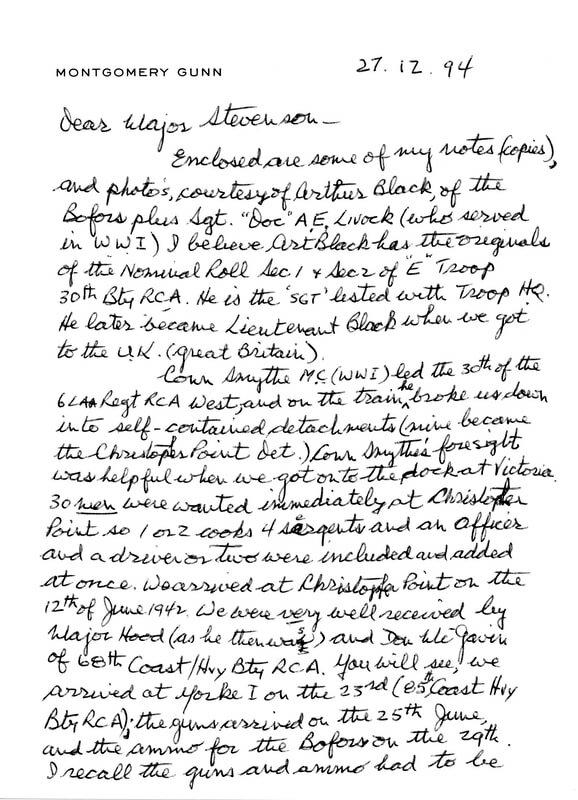 Signed by the Adjutant-General Maj-Gen Letson. 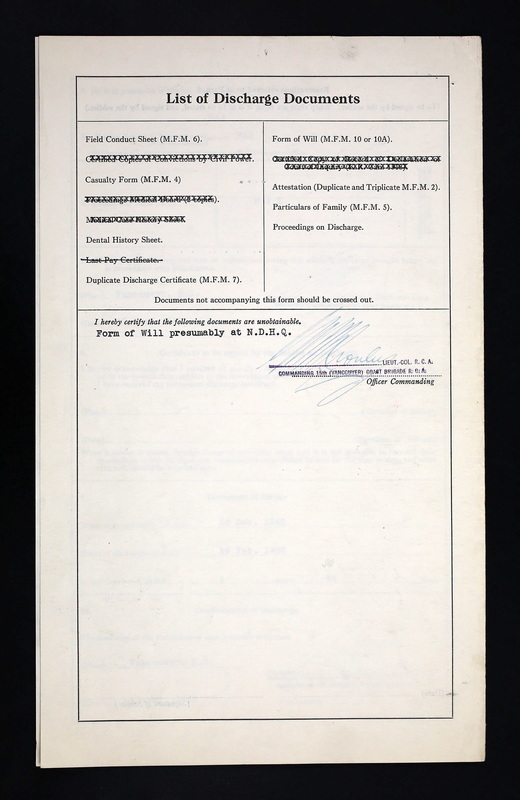 17 March 1942 – A Proceedings on Discharge (2 pages) is filled out. 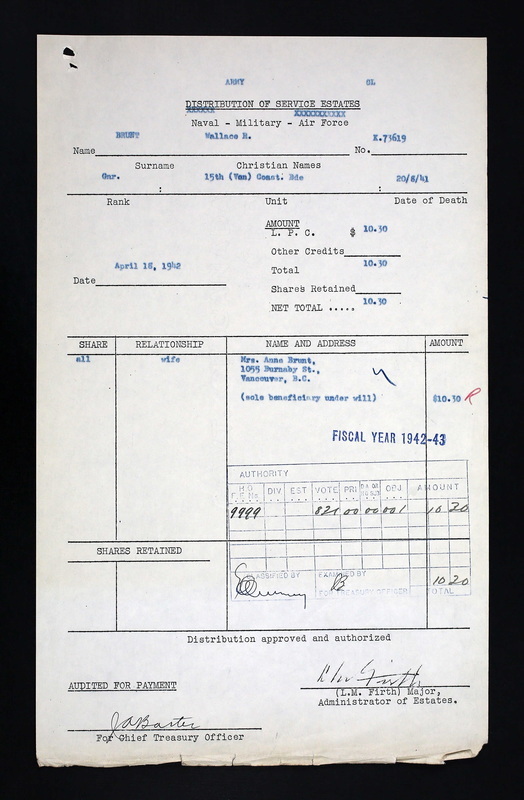 The original date of 19 February 1942 was edited back to 20 Aug 1941 to reflect the actual day of death. It was signed by the Commanding Officer of 15th (Vancouver) Coast Brigade R.C.A. although the signature does not appear to be that of Lieut-Col Underhill. 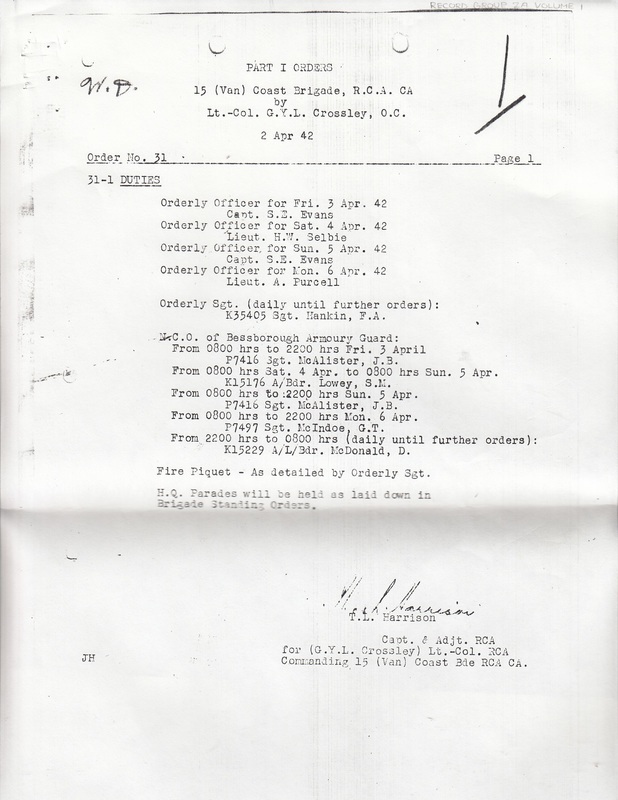 17 March 1942 – List of Discharge Documents. Also signed by the Commanding Officer of 15th (Vancouver) Coast Brigade R.C.A. 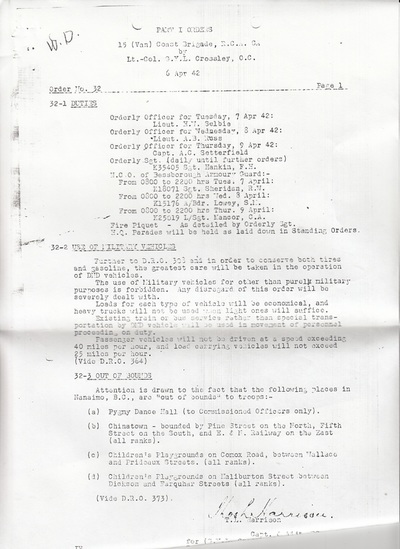 27 March 1942 – Cover letter to Military District 11 with Acceptance of death form as enclosure. 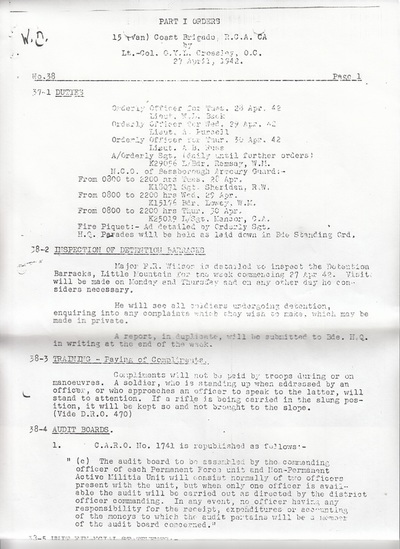 18 April 1942 – Distribution of Service Estates – In the amount of $10.30 forwarded to Gunner Brunt’s wife. 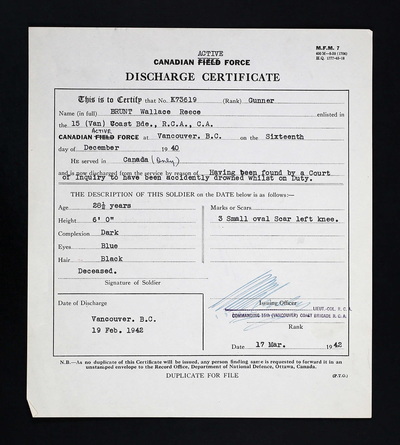 Gunner Dessureault was a Private in the Lincoln Regiment from 1933 to 1935 before being taken on strength as a Gunner with 31st Heavy Battery 15th (Vancouver) Coast Brigade on 26 June 1940. 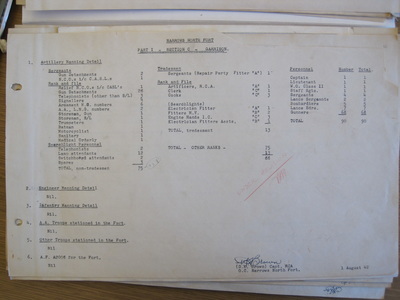 He subsequently transferred to 16th Light Anti-Aircraft Battery, 3 Light Anti-Aircraft Regiment, RCA on 5 September 1940 and was reported missing from Combined Operations (Dieppe) on 22 August 1942. He was declared killed in action effective 19 August 1942 on 14 June 1943 and is buried at Dieppe Canadian War Cemetery. Taken on strength 1st Anti-Aircraft Regiment Royal Canadian Artillery Canadian Active Service Force 25 Jun 1940, posted to 11 Anti-Aircraft Battery Canadian Active Service Force 25 June 1940, posted 16th Light Anti-Aircraft Battery Canadian Active Service Force 1 Sep 1940, taken on strength Canadian Army (Overseas) 6 Apr 1941, 3rd Light Anti-Aircraft Regiment Royal Canadian Artillery 29 April 1941, promoted Acting Lance Bombardier 1 Dec 1941, proceeded to 49 Anti-Aircraft Brigade Air Recognition Spotters Course 18 Jan 1942, appointed Acting Bombardier 3 Jun 1942, killed in action Dieppe 19 Aug 1942.